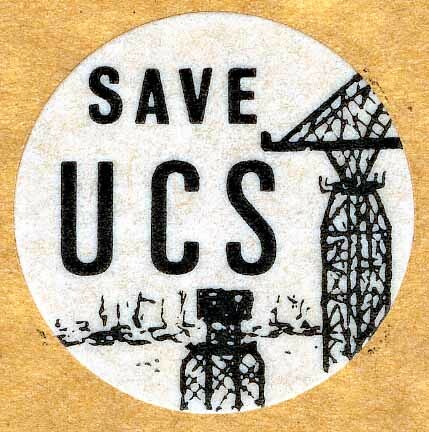 Upper Clyde Shipbuilders sticker, 1971, originally uploaded by Scottish Political Archive. In 1968 the Labour government facilitated the amalgamation of ship yards on the Upper Clyde to form the Upper Clyde Shipbuilders. 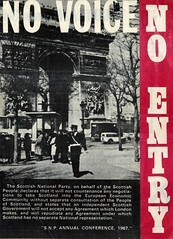 In 1971, UCS sought financial help and looked to the new Conservative Government for assistance. The Government announced they would refuse any more subsidies and appointed a liquidator instead. 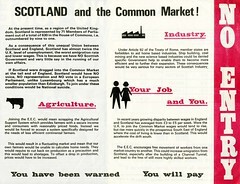 The confrontation and the following work-in of 1971 and 1972 culminated in three of the yards, Govan, Scotstoun and Linthouse, operating under the ‘Govan Shipbuilders Ltd’ new grouping, and the fourth, the Clydebank yard, as ‘Marathon Manufacturing’ making rigs for the growing oil industry. 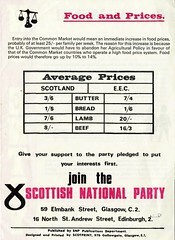 This leaflet forms part of the Upper Clyde Shipbuilders Collection at the Scottish Political Archive.